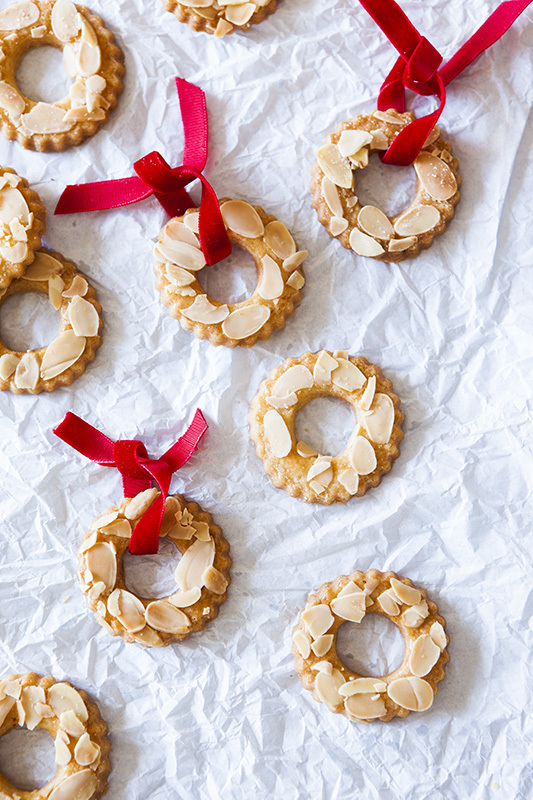 These Kerstkransjes are one of the prettiest Dutch Christmas biscuits out there. I always love making them as the flavour is really buttery and simple but they can double up as a Christmas decoration. I’ve used the same cutter as I have done in my Linzer Cookie post, which gives that hole in the center to hang up on your tree or on any decoration around the house. At the moment I’m on a bit of a biscuit/cookie buzz, so I’ve been trying out loads of different biscuit recipes and playing around with flavours. For Christmas day this year, I’m intending to make a platter full of varying biscuits, some German, some Scandinavian and of course some Dutch. I think it might be a nice idea especially when you are just so stuffed from Christmas dinner but still want something sweet and flavoursome with Tea & Coffee. Although saying that I’m also going to be making a 3 tiered spiced Rosemary cake…….have to make sure everyone is happy. I’ll definitely be adding these little fellas into my Christmas platter, as they have that perfect flavour and texture for a biscuit that no one can resist, who could say no when they are hanging with those little velvet ribbons either? In stand mixer, mix together the butter, caster sugar, milk, salt and lemon zest until everything is incorporated and fluffy. Add in the flour and baking powder, mix until you have a dough. Wrap in some cling film and stick it into the fridge for about an hour. In a small bowl, whisk the egg and brush over all of the biscuits. Sprinkle with sliced almonds and some granulated sugar to make them sparkle and place on a baking sheet. Bake in the oven for about 15/20 mins. Keep an eye on them as they can burn quite easily. These look really pretty hung on the tree and are great fun for for little hands to find and eat when visiting.